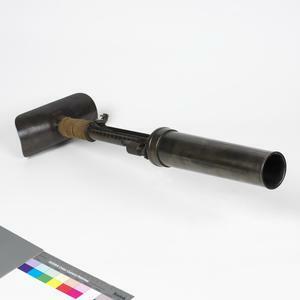 mortar grenade discharger comprising a steel pipe-like rifled barrel which is attached to a small, curved base plate that could be fitted over a medium sized tree trunk if required. The trigger housing is a tubular piece of metal with a lengthwise slot. The discharger has range scales on both sides of the trigger slot and the range was set by turning the elevating knob, which effectively lengthened of shortened the trigger housing extending inside the barrel, and thus the range of the weapon was determined by the distance travelled by the projectile through the barrel. The overall length is 24in, of which the barrel is 10in, and it weighed 10.25lb empty. 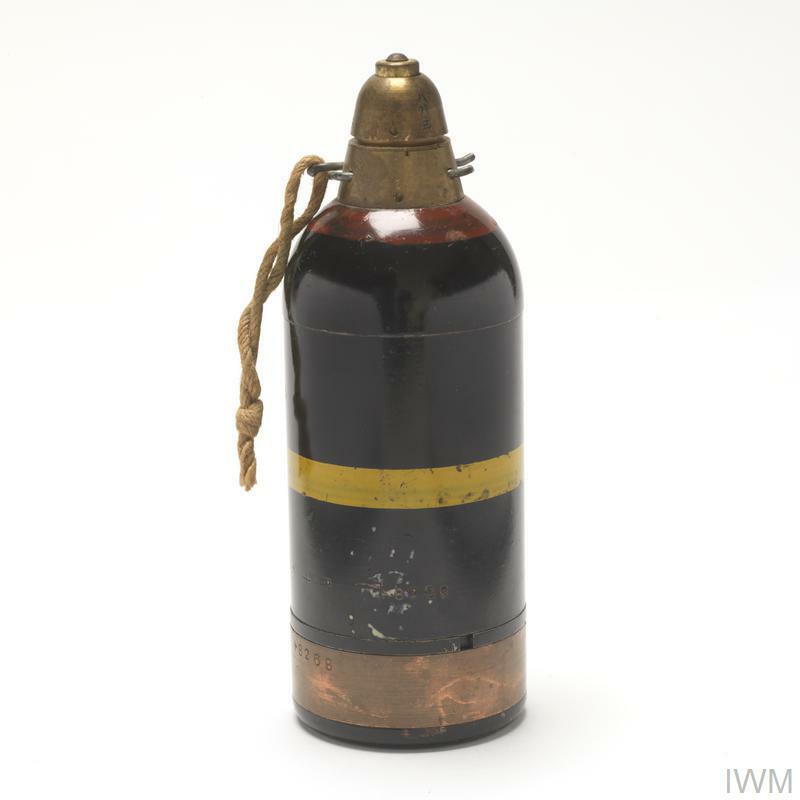 Second World War period Japanese Army grenade discharger. grenade discharger comprising a steel pipe-like rifled barrel which is attached to a small, curved base plate that could be fitted over a medium sized tree trunk if required. The trigger housing is a tubular piece of metal with a lengthwise slot. The discharger has range scales on both sides of the trigger slot and the range was set by turning the elevating knob, which effectively lengthened of shortened the trigger housing extending inside the barrel, and thus the range of the weapon was determined by the distance travelled by the projectile through the barrel. The overall length is 24in, of which the barrel is 10in, and it weighed 10.25lb empty.